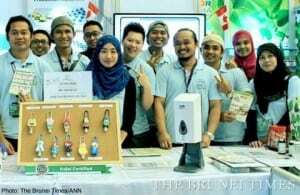 Simpor Pharma Sdn Bhd, the first pharmaceutical plant in Brunei, launched its initial range of halal health supplements at yesterday’s opening of the Third ASEAN Consumer Fair (ACF). The health supplements, which are being marketed under the SP brand, include Omega-3 fish oil softgels, Omega-3 fish oil and tumeric softgels, Omega-3 fish oil and folic acid softgels, multi-vitamin tablets, vitamin E softgels, B-complex tablets, vitamin C powder, CoQ10 softgels as well as Omega-3 gummies. The supplements, which sell for $10 to $25 per bottle, are available at one of the booths in the five-day fair. Simpor Pharma executives said the company will first develop the local market for its products before venturing overseas. “We definitely have plans to expand and export but our main focus now is the local audience. We want the brand to be recognised in the country as a top brand of health supplements,” said Aeriena Sahri, Simpor Pharma’s research and development specialist. Jack Sim, Simpor Phama’s spokesperson, said SP products will soon be distributed nationwide. “We are trying to outsource our products to retailers such as clinics and also distributors so that everyone in Brunei can access them,” he said. Sim said their products are “very cheap” compared to its competitors “because we want everyone to be able to afford them”. Apart from using the ACF as a testing ground for the company’s first batch of products, Aerina said Simpor Pharma is also taking this opportunity to raise health awareness in the Sultanate. “In other countries, people take health supplements daily. But we find that in Brunei, there’s not much awareness on the benefits that products such as fish oil and vitamin E can give. Our goal is to make people realise that they need to take better care of their health,” she said. According to Aeriena, fish oil has been proven to reduce the risk of cardiovascular disease while vitamin E heps prevent cancer. These supplements can also help those who have heart ailments and serious illness. “While fish oil and vitamin E are geared towards more mature clients, we also have Omega-3 gummies that children can snack on. For those women who are interested in improving their skin and overall wellness, we have CoQ10 softgels as well,” she said. Apart from supplements, the company is developing other halal products like health drinks, hand sanitiser and cosmetics. Sim said the company is offering instant chocolate drinks to ACF visitors. “We are getting the public to test our health drinks before we actually manufacture them for the public. From their response, we will know what changes need to be made to ensure that customers will like our products,” he said. Simpor Pharma was established to produce Syariah-compliant pharmaceutical products for export to Muslim markets in Asia. In a previous report, an official from Simpor Pharma said the plant was established by Viva Canada as a base for expanding its product range into Muslim countries. Viva Canada had selected Brunei as a base due to its political stability.